This summer I have had the pleasure of arranging a lot of Great Fosters wedding flowers, some very lovely and classic, some very girlie, some very romantic, some very wild or rustic… But none of them beat this lovely wedding for its originality factor. Gemma’s vision for her rockabilly themed wedding were rustic displays – twigs / bark / wooden plates, with a real pop rock attitude and musical references. So I got to find out more about ‘rockabilly’ – apparently an early 50’s style of rock & roll music, blending country & western and rhythm and blues. Then, inspired by her pop bright retro coloured bridesmaids dresses – one red, one yellow and one orange, like 1950s pinups, I set my mind to how this can all come together. 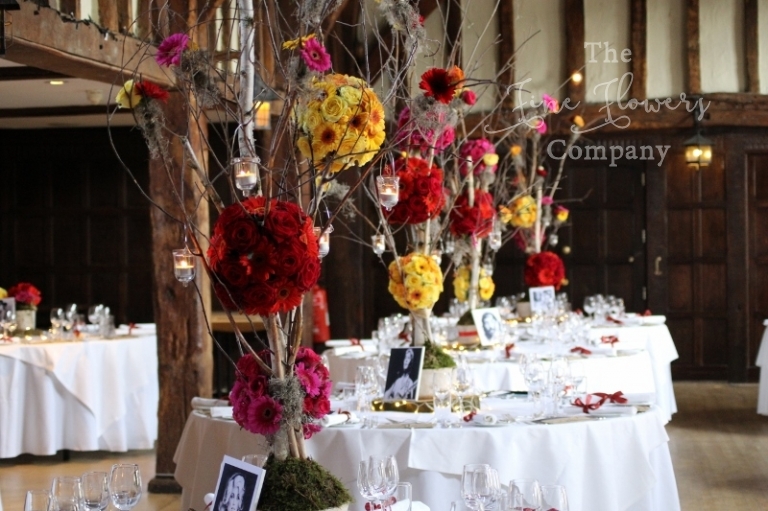 The result was unique and striking and made the Tithe Barn at Great Fosters look truly amazing with bold colours, rustic tree like structures and flowers and wooden supports seemlessly blending together. 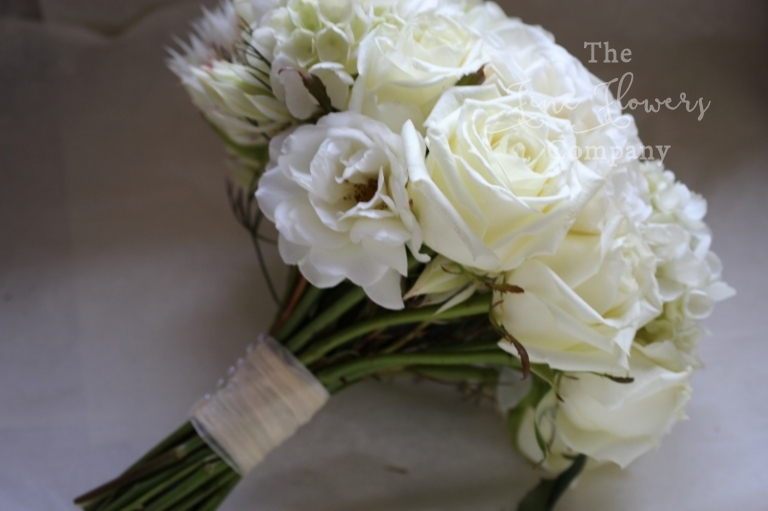 For her bouquet, Gemma made the only exception to colour and opted for a very vintage bouquet of ivory hydrangeas, mini white proteas and bloomy spray roses. 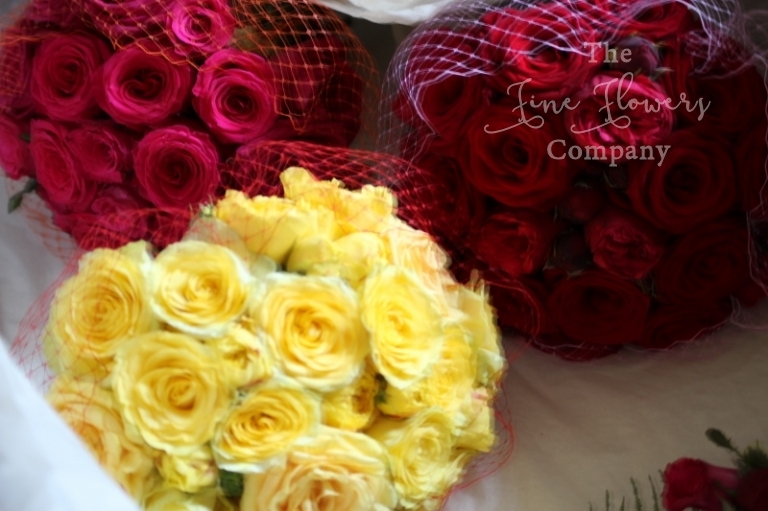 For her bridesmaids, we created bold vintage bouquets of roses contrasting with their dresses, with birdcage veiling rouched around them to echo their vintage fascinators. 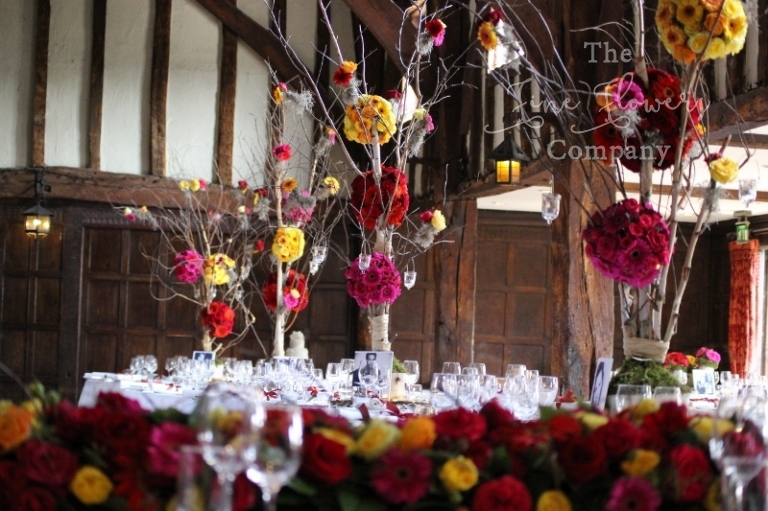 The Great Fosters wedding flowers for the reception in the tithe barn were a mix of tall rustic twig tree like centrepieces, and low rustic displays atop of birch tree logs. All were placed on genuine wooden trunk plates coming from huge silver birch trees. For the head table we created a rustic runner of tightly packed roses and gerberas accented with rustic fine twigs, and for the kids table we made up a cluster of cute mini milk bottles with happy tri-coloured gerberas. Gemma had created unique guest name cards in the shape of old records and the tables were named after famous country & rock singers and bands – Dixie Chicks, Bruce Springsteen and so on.